Thanks to a new, stronger cover and revised internal geometry, this 10.5 inch clutch operates with 10% less pedal effort with no loss in holding power. This is the perfect upgrade for your power adder Mustang and can support well into the 600-650 Horsepower range. Includes parts M-7550-A302 disc, M-7563-C302 pressure plate and D9ZZ-7548-A throwout bearing. 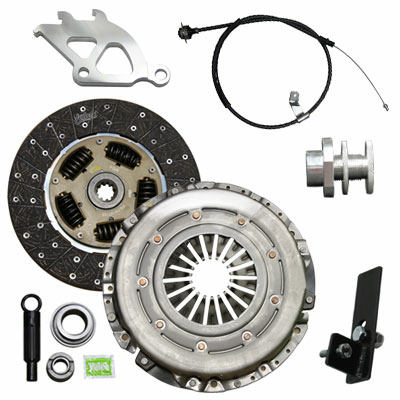 UPR's Clutch Cable/Quadrant and Firewall Adjuster Kit is the ultimate package for your 79-95 Mustang. Includes our Triple hook quadrant that was recently redesigned with a new radius that decreases pedal effort by 20%. Also includes our best selling Double Lock Firewall Adjuster that is easy to set and lock into place. Plus you also get our Clutch Cable, which features low friction liner and Heavy Duty stainless steel wire. Manufactured by Valeo who also makes them for Ford and are also covered for manufacturer defects through Valeo. Firewall adjuster and quadrant are both CNC Machined 6061 Billet Aluminum and anodized giving you a precise fit and durable finish. Installs in 3-4 hours or less. 1986 1987 1988 1989 1990 1991 1992 1993 1994 1995 1996 1997 1998 1999 2000 2001* V8 5.0L 4.6L GT GTS Cobra Mustang Roush & Saleen Vehicles. 1993 1994 1995 1996 1997 1998 1999** V8 4.6L 4V 281 Cobra Mustang Roush & Saleen Vehicles. *Will not work in cars that originally came with 11" clutches. Mid 2001 Ford changed over to an 11" clutch in the GT so verify which one you have **Early 1999 Cobra's came with a 10.5" clutch and was changed over to an 11" clutch. Verify size on your car before order.